Our Yellow Networker Side Tear Checks were born of the idea that our actions affect others in ways we sometimes can't even imagine. The graphic designer who came up with this intriguing style was influenced by the ripples that emanate when a stone is cast into water. Those ripples go out to others just as they come back toward you. They serve as a reminder to walk purposefully through life, with consideration for those who'll be affected by your thoughts and behavior. 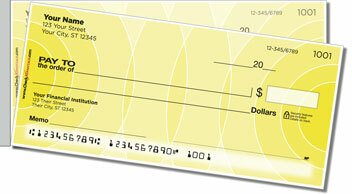 But a hot concept isn't the only reason to love these Yellow Networker Side Tear Checks from CheckAdvantage! Their real value lies in the short line of perforation on the left, which lets you separate your completed documents quickly and cleanly from the pad. That means you won't waste checks because of accidental rips. Now that's influential! Order your very own Yellow Networker Side Tear Checks and matching address labels today!